After viewing the Lost Honor cinematic at BlizzCon 2018, it was clear that Saurfang’s tale was far from over. 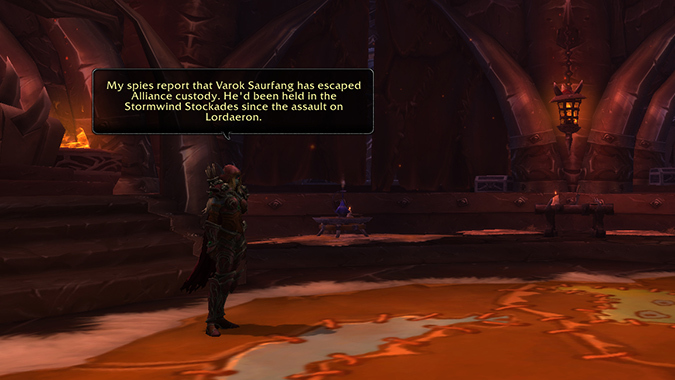 King Anduin Wrynn left a cell door and a world of possibility open for Varok, and the old Orc apparently decided to take advantage of that. Horde players can now follow that story by accepting a quest from Dark Ranger Alina, who is patiently waiting aboard the Wind’s Redemption in Zuldazar. Without spoiling too much information, this is a quest chain you really don’t want to miss, as it includes a moment of choice where a player can intentionally pick a side. Be forewarned, however — one side will give you a new toy for your Toy Box, the other holds tantalizing promise of vengeance to come. This isn’t the first time Horde players have been afforded a decision in patch 8.1 — they were also allowed to choose whether to handle a job themselves, or let Nathanos Blightcaller do the deed in the introduction to the Darkshore Warfront. Blizzard has usually been fairly straightforward in quest delivery, with your character simply carrying out whatever tasks were handed to them at the time. This expansion seems to be letting players off the rails a little bit and giving them a sense of agency that wasn’t really present before. At the moment, we don’t really know where those choices are going to lead. But simply offering that choice is throwing a different spin on the proceedings — players have an opportunity to really think about what they’re doing, and where their loyalties actually lie. Do you side with the Banshee Queen above all else, and carry out her demands? Or are you beginning to question what those demands are actually leading towards, when all is said and done? It’s entirely up to you to make that call. And if you don’t have your in-game sound turned up, make sure you do so before undertaking this journey. Patty Mattson delivers an absolutely stunning performance as Sylvanas here, and if you weren’t already wary of the Dark Lady, the stone-cold, delicate precision of her words may give you slightly more pause. Where, exactly, this story is headed remains to be seen — but thanks to the current quest chain, Horde players have more of a say in its direction than ever before.